When you hike, you tend to be very focused on weather forecasts; some would say obsessed, even. Weather-appropriate clothing can be the difference between enjoying a hike or not. And, if you hike often enough, you learn to parse the weather report to determine what the weather really is going to be like. For instance, "showers" means rain on, rain off, but usually it's mostly off. "Rain" of course, means always on and never off. In dramatic contrast to the recent run of hot weather, the forecast called for showers with cool temperatures. 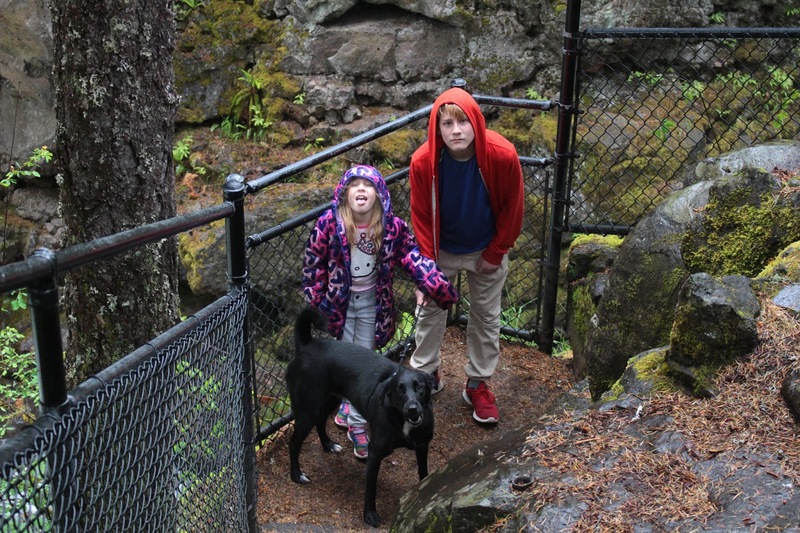 Since it would be mostly dry weather with occasional rainfall, I thought it'd be mighty grandfatherly of me to take Aiden and Coral Rae hiking on the Upper Rogue River Trail. I wonder if they are still mad at me. The reality was that, as forecast, it was cold, but it was all rain and no showers. 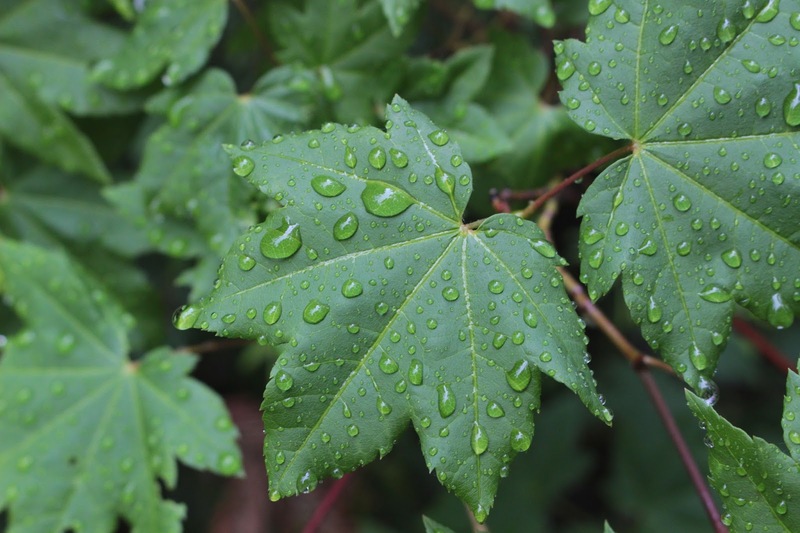 And not just mere rain, either: it was constant rain with raindrops as fat and juicy as waterlogged raisins. 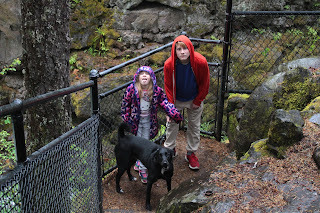 And my darling grandchildren brought no raingear with them either. So what to do? Why, make them go hiking anyway, of course? What kind of grandfather do you think I am, anyway? Like I would really do that! As we drove up the highway, windshield wipers set on "fastest", waiting and hoping in vain for the rain to let up, we decided that unless things changed markedly, we would pretty much scrap the hiking and just make this a car trip. And that's exactly what happened. 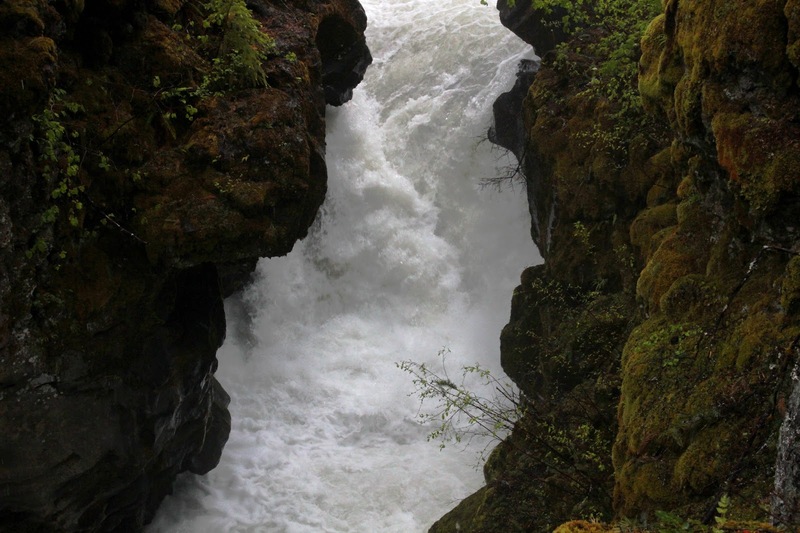 At Natural Bridge, the Rogue River funnels into a collapsed lava tube. 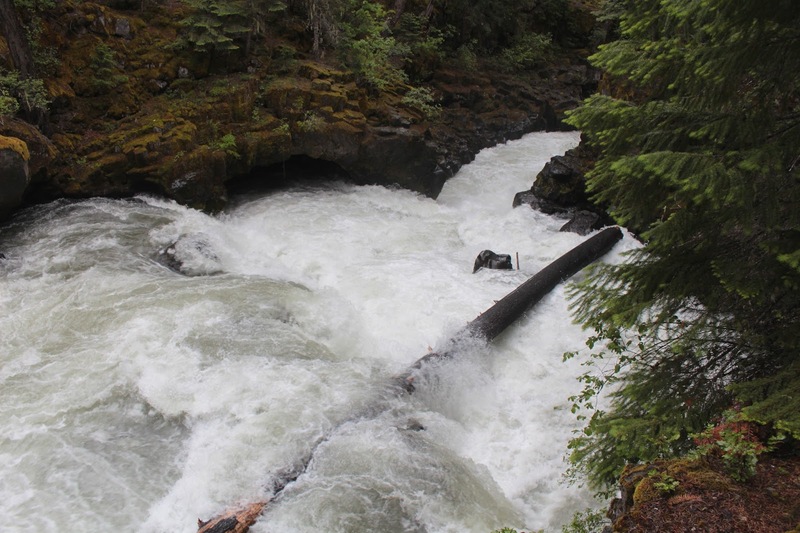 But there is a stretch of lava tube that still has a roof overhead and the Rogue River disappears into the tube only to reappear about 75 yards further downstream. However, in the middle of a spring flood and torrential downpour the river overwhelms the natural bridge and it looks like just another angry river in a slot canyon. Anyway, the kids, Luna (my dog), and I walked on the short paved section of trail replete with fenced viewpoints overlooking the rampaging river below. Occasionally the clouds lifted and we could see snow in the hills above; we probably were just several hundred feet below where rain became snow. From there, we drove up the highway and stopped at the Rogue Gorge. Here, it's the same sort of geology that occurs at Natural Bridge, the main difference being the collapsed lava tube is narrower and there is no section of the lava tube that is fully intact. 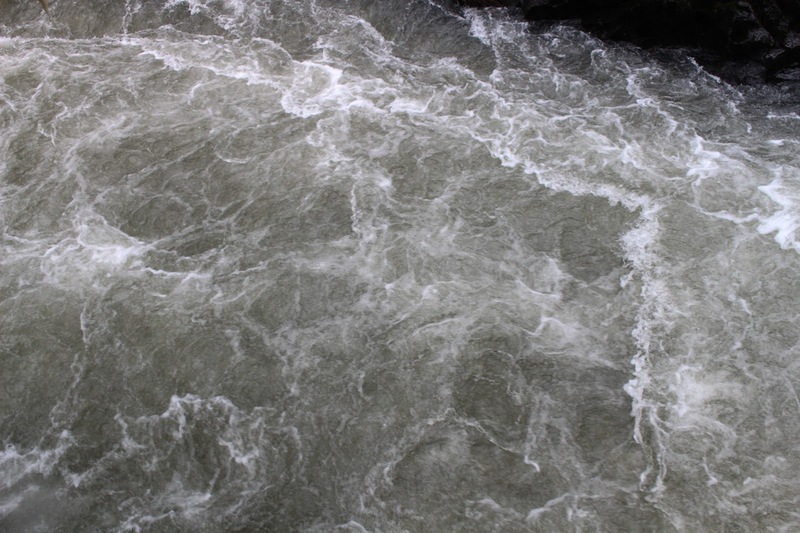 The river chafes and seethes at being so constrained and the white water roiling between the rock walls is pretty spectacular. Despite the incredible vista, we didn't stay very long as cold rain trumped scenery. It was a long drive for a couple of car stops but we were all OK with that, with maybe the exception of Luna who is always eager for more. But the day was saved when we stopped at Beckie's Restaurant for jalapeno burgers. Aiden avowed it was the best hamburger in the entire universe so the day was not a total loss. For more photos, please visit the Flickr album. Wow that's a really cool sight! I had no idea this natural phenomenon existed in Oregon. Probably not too far away from the Union Creek Resort where I stayed this winter when I snowshoed at Crater Lake. 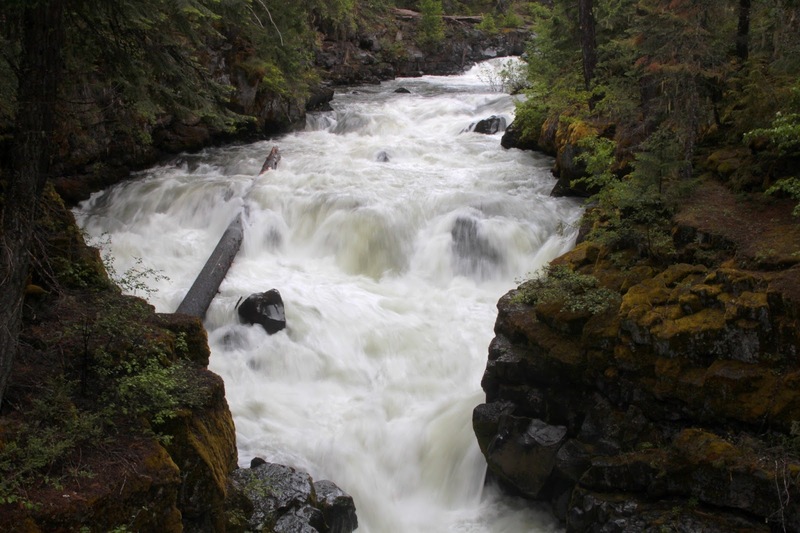 The Rogue Gorge is virtually across the street from the Union Creek Store, it's just to the north of Beckie's Restaurant. I snowshoed to the gorge one winter, that was memorable with all the icicles clinging to the gorge walls. 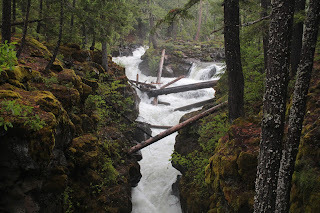 Natural Bridge is several miles to the south of Union Creek and is well marked on the highway. A couple of days ago, I was hiking in nearly 100 degree weather and asked the powers that be for some clouds. The clouds came in, took a mere 15 minutes for the sun to disappear and in another 5 minutes the thunder started. I hoofed it in panic the 4 miles back to the car and despite the clouds, wind, and thunder, I don't think it got even 5 degrees cooler! That all probably falls under the category of "Be careful, you might get what you asked for..."